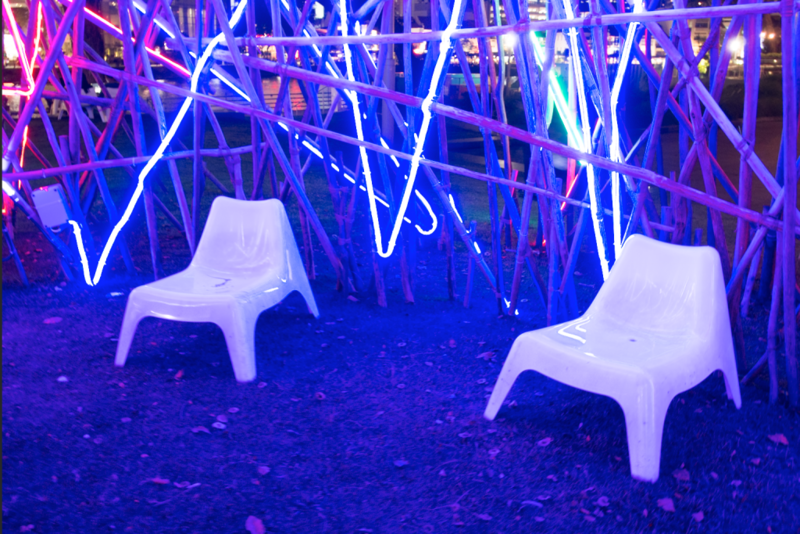 An enormous cluster of glowing sticks sitting on the lawn of The Art House makes for a perfect Instagram shot. The story behind doesn’t fall short either. 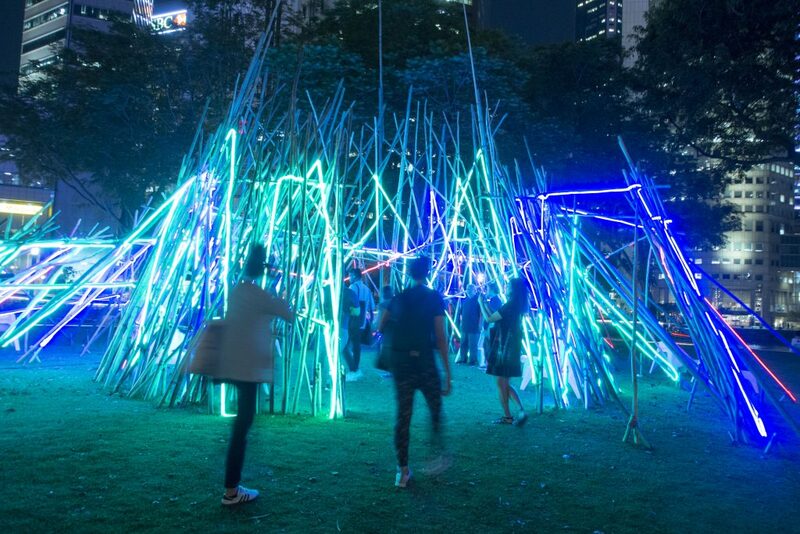 This installation, titled Sticks, was one of the many eye-catching exhibits at the recently-concluded Art Week edition of the Light to Night Festival. It’s meant as a tribute to his favorite childhood game, pick-a-stick, said its creator Mr Sebastian Chun. 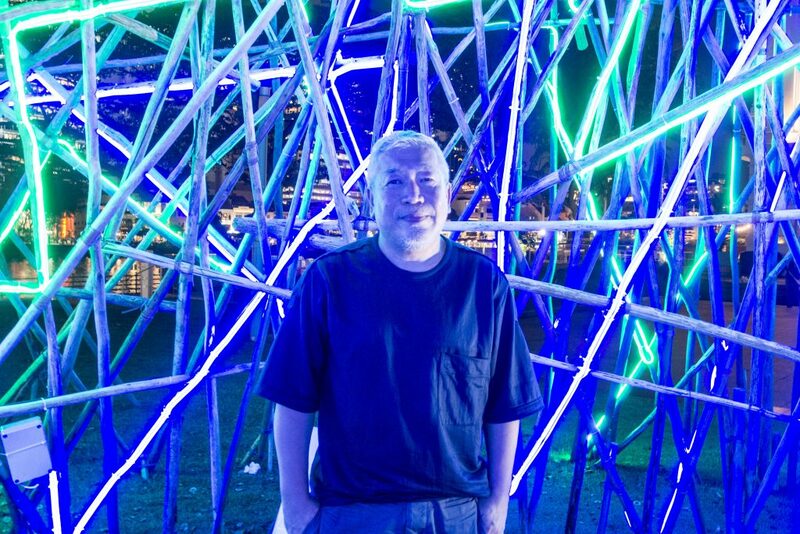 The 54-year-old artist-designer added that his installation was also inspired by the bakau wood piles that he used to see a lot as a child. “There used to be a lot of opera stages, built with bakau wood using the same construction techniques in the past…I found them fascinating,” he recounted. With chairs forming a circle inside the hut of sticks, the interactive exhibit also doubled up as a shelter from the heat in the day. Mr Chun said while Sticks is a tribute to his childhood, he welcomes other interpretations of his work. He hopes people will question art and connect with it in their own ways. “If we spend a minute to read about the artwork, do a little bit of research, then we will realize the past and memories we used to have in history,” he said. 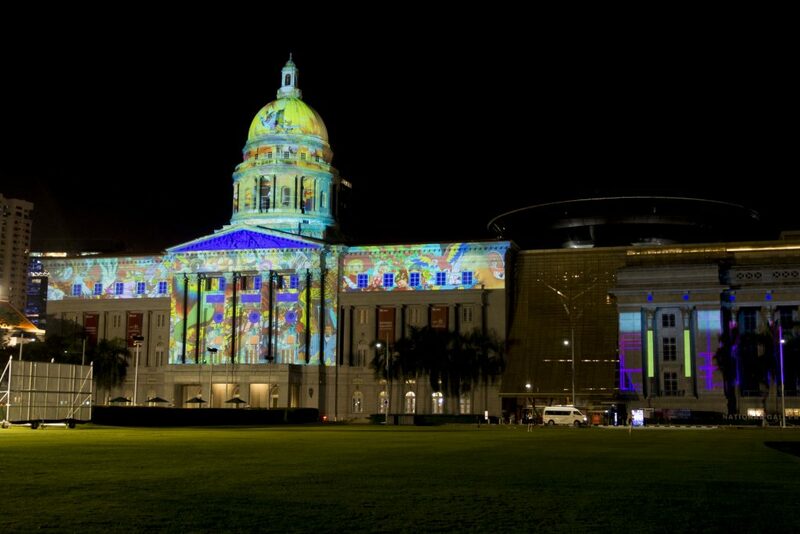 The Light to Night Festival is an annual urban art event that takes place in Singapore’s civic district, spanning both indoor and outdoor spaces of National Gallery, The Arts House, Asian Civilisation Museum, The Esplanade Park and Victoria Theatre and Concert Hall. This year’s festival, Traces and Echoes, features 2 editions: Singapore Art Week (Jan 18 – Jan 27) and Singapore Bicentennial (Jan 28 – Feb 24). Besides Sticks, several other exhibits were also inspired by childhoodgames and children’s books. Open Books, for example, is an outdoor installation by various Singaporean creatives and co-designed by The Merry Men Works, a local carpentry specialist. 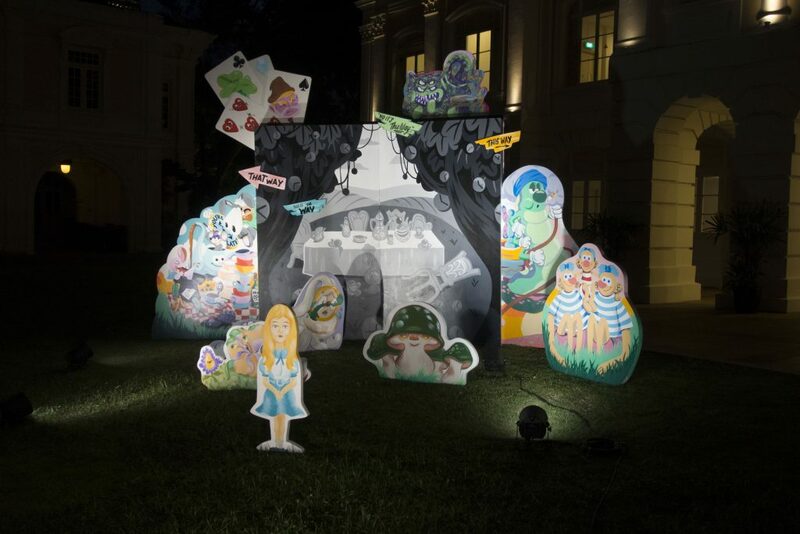 It shows the artists’ evolving take on popular children’s tales in a life-sized exhibit. In this exhibit on Lewis Caroll’s Alice’s Adventures in Wonderland, the characters are all re-interpreted. The pipe-smoking Caterpillar wears a turban. The Cheshire Cat is villainized with razor-sharp teeth and four eyes. Smack right in the middle is the trademark Mad Hatter tea table, looking dreary in black and white. “It’s interesting because there’s a dichotomy between the black and white of the book and the fact that the characters outside are all colored. When the characters leave the book, the book is not called Alice in Wonderland,” said a spokesperson from Tell Your Children, a collective of local mural artists. There’s also an exhibit on Italo Calvino’s Invisible Cities, which is a classic retelling of the adventures of Marco Polo. 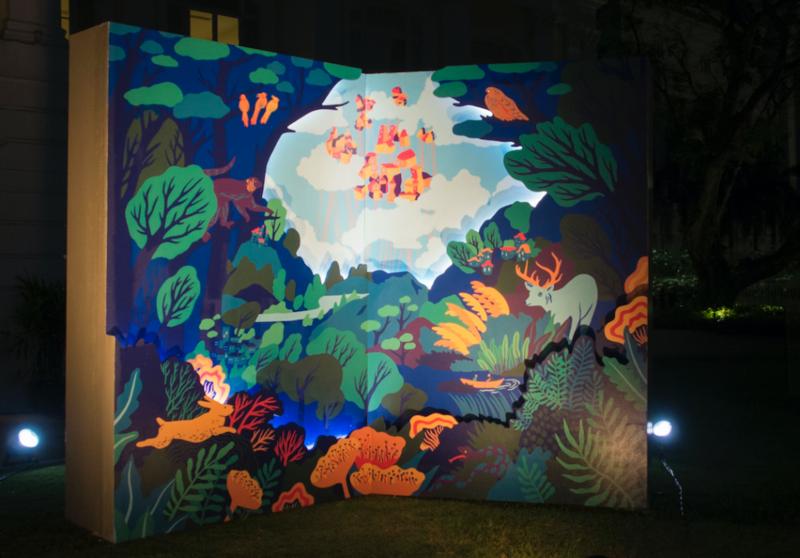 Ms Tan Zi Xi, who goes by the moniker MessyMsxi, said the diorama is a scene from the book, where traveler journeys through a fantastical forest into the city of Baucis. She added that she hopes the exhibit will encourage kids to pick up the book. The Light to Night Festival’s Bicentennial edition is ongoing.